Interested in trying something completely different? Stand Up Paddleboarding (SUP) is a cross over between paddling and surfing and is currently the fastest growing water sport. It makes you feel like you're walking on the water. One of the best things about Stand Up Paddleboarding is it’s versatility. It really is up to you on how you plan your day on the water, and there is always a paddle that will fit your style. From unwinding on peaceful, calm water while staring up at majestic mountain peaks, to more workout-focused paddling, to just sharing a fun day on the water with friends and family. Stand Up Paddleboarding is the activity for you! If you’re new to the sport, taking a lesson is a good idea. Come and learn how to SUP with us! We offer full day (9:30am-4:30pm) or evening session (6pm-7:30pm) sessions by request. 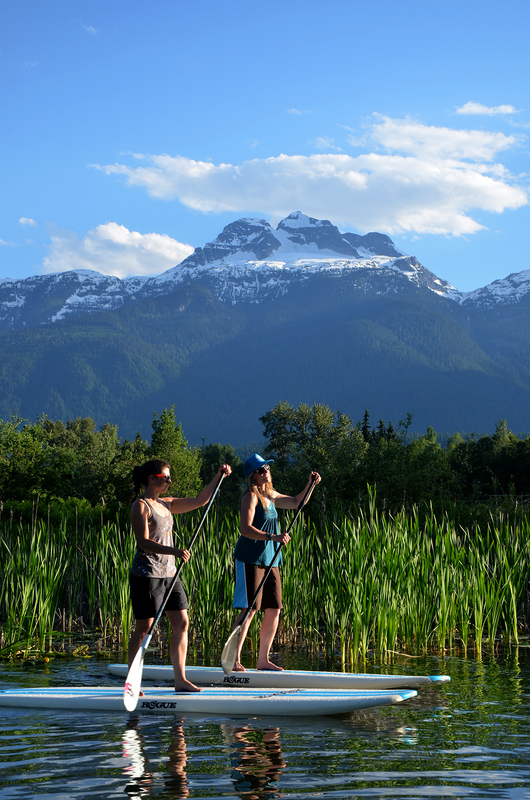 The full day will be a guided SUP session and the evening will specifically be a yoga SUP session. In both sessions you will receive full instruction, a paddleboard with paddle, and all the gear. All tours are guided by our friends at Stoke Paddleboard Adventures. Lunch is an additional $15 and can be added to your online booking. Please specify on the booking your dietary requirements. Can I just rent a SUP please? Of course, please contact Stoke Paddleboard Adventures directly for their rates.